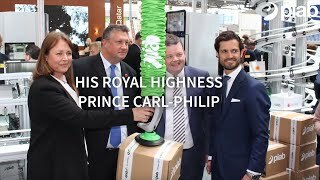 Taby, Sweden – Following in the footsteps of his father, King Carl XVI Gustaf of Sweden, Prince Carl Philip, Duke of Värmland, paid a visit to Piab’s stand at the Hannover Messe, 1-5 April, 2019, where he was introduced to the company’s latest generation of vacuum lifters. Outwardly very similar to the company’s first vacuum lifter introduced to the King at a technology trade fair in Stockholm in 1981, the piLIFT® SMART is, in fact, quite different from its predecessor. Representing a completely new generation of vacuum lifters, the piLIFT® SMART is indeed technology royalty. Marking the start of a new era for vacuum lifters, the piLIFT® SMART is the world’s first vacuum lifter that is ready for Industry 4.0. Offering data features based on internet connectivity, it is smarter than other vacuum lifters, although it is still based on the same principles of physics as all vacuum lifters. However, the benefits don’t stop there. The piLIFT® SMART also offers smart automatic functions, utilises highly energy-efficient vacuum technology, operates at a very low sound level, and is ergonomic by design. Ergonomics has been at the heart of Piab’s vacuum lifters since their conception. When the young King Carl Gustaf visited the Vaculex exhibition in 1981, he came face to face with not only the very first, groundbreaking vacuum tube lifter, as it was initially called, but also one of the founders of Vaculex (now Piab). “Since that royal encounter in 1981, Vaculex and Piab have been at the forefront of innovation, continually producing ergonomic solutions to meet the need of industry worldwide,” says David Collins, Vice President and Head of Piab’s Ergonomic Handling Division. The recently launched piLIFT® SMART represents the pinnacle of this ambitious technological development. By sensing and monitoring movements and responding quickly to user intentions, the user-friendly and smart vacuum lifter can lift and weigh loads simultaneously. It will collect and log data in real-time, making process statistics and analyses immediately accessible to its users via an intuitive web platform log-in. Underpinned by patented technology that enables its power consumption to be reduced by a staggering 76 percent, piLIFT® SMART can lift loads of up to 40 kg, making it a handy tool for a multitude of tasks within a broad range of industries. Left photo: In 1981 in Stockholm, King Carl XVI Gustaf of Sweden (right) was introduced to the original vacuum tube lifter by Stellan Petré, one of the two founders of Vaculex, which later became Piab’s Ergonomic Handling Division. Right photo: In 2019 in Hannover, Prince Carl Philip (right), representing the next generation of the Swedish royal family, met the latest generation of vacuum lifters, the piLIFT® SMART, and (from the left Anders Lindqvist, CEO Piab and David Collins of VP and Head of Piab’s Ergonomic Handling Division.